Fairfax, Virginia. July 29, 2014 – Lockheed Martin has awarded a $25.4 million full-production contract to General Dynamics Advanced Information Systems to support the U.S. Air Force Global Positioning System (GPS) III Network Communications Element (NCE) for space vehicles seven and eight (SV 07-08). GPS III, a critically important program for the Air Force, will affordably replace aging GPS satellites in orbit while improving capability to meet the evolving demands of military, commercial and civilian users. Compared to prior GPS vehicles, the Air Force’s GPS III satellites will deliver three times better accuracy, provide up to eight times more powerful anti-jamming capabilities and include enhancements that extend spacecraft life 25 percent further. 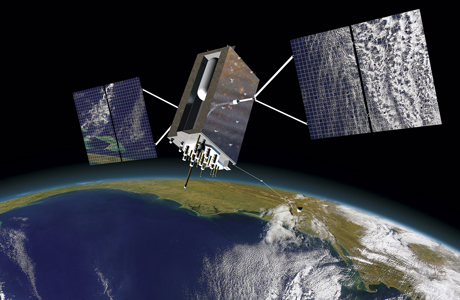 GPS III-series satellites also will carry a new civil signal designed to be interoperable with other international global navigation satellite systems, enhancing civilian-user connectivity. General Dynamics’ NCE components provide the communications functions for the GPS III satellites, including the ground-to-space command and control channel, the space-to-space inter-satellite channel and the command and telemetry communications channels within each satellite. General Dynamics is now under contract with Lockheed Martin for GPS III SV 01-08. Delivery of the NCE components for SV03 and SV04 are scheduled for this summer. The majority of the work under contract will be performed at the General Dynamics Advanced Information Systems facilities in Scottsdale, Arizona and Bloomington, Minnesota.